Offer the most popular poker game at your party! 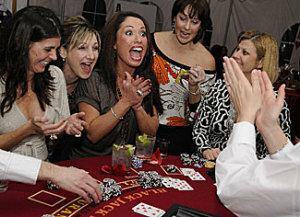 Casino Poker has long been a favorite of the casino night theme. We have all types of poker but the most popular variant now is Texas Hold’em. In Texas Hold’em, bets grow very quickly and game tempo is much faster. At any time a player may be forced to wager all of their chips in order to stay in a hand. Wow VIP Events offers a variety of alternatives if you are interested in having Texas Hold’em at your casino night party. Texas Hold’em– regulation size tables complete with all accessories, setup, breakdown and tax pucks, and two new decks of cards. 6′ Texas Hold’em Table – 6′ Table seats 8 players plus the dealer. 7′ Texas Hold’em Table – 7′ Table Seats 10 players plus the dealer. Contact Wow VIP Events at 972/300.4100 if you have any questions regarding renting Texas Hold’em for your Casino Night Party, or fill out our Request a Quote form. We cannot use real money on any of the tables. On Texas Hold’em tournaments, if they get together outside the party and each contribute an amount to pay for the tables and to have prizes, this is okay as long as we have nothing to do with the awarding of prizes. We can collect vouchers and give them to the top winners, but that is all we can do. For other parties, we furnish two-sided tickets for drawings of prizes. We also furnish fake money to start the party.